Calling all photographers: enter the Matanzas River photo contest! We want to see your best photos of the Matanzas River! Together with the Matanzas Riverkeeper and the South Anastasia Communities Association, we're delighted to announce our first-ever photo contest in celebration of the Matanzas River. We're accepting photo submissions in four categories: Landscape, People/Recreation, Wildlife/Nature, and Weather. Our submission window opens 9/10/18 at noon, and closes 11/5/18 at 5pm. Send any questions to matanzasvoices@gmail.com, and refer to the guidelines below. ○ This contest is open to all. ○ There is no submission fee. ○ Photos must be taken on the Matanzas River and/or her tributaries. ○ All images must be original work by the submitter. ○ Submission window opens Monday, September 10th, 2018 at 12pm. ○ Limit 8 entries per person, with a maximum of 2 entries per category. ○ Photos should be submitted in a jpeg format (filename extension .jpg) with a resolution of 200-300 dpi. ○ A brief description should accompany the photo including your name, date and location of the photo, and any other details you would like to include. ○ All photos must be received by 5pm, Monday, October 8th, 2018. ○ When you submit a photo you consent to have it posted on sponsoring organizations’ websites and/or social media sites, and considered for post-contest exhibition. ○ Winners in each category will be chosen by representatives from the sponsoring organizations and notified mid-October. I've always loved this time of year, when the chaotic days of spring stretch into the lazy days of summer. The mullet start running on the beach. Surf picks up. Afternoon rainstorms give us a break from the heat. It also means that Matanzas Voices is gearing up for some new work, from interviews to events. Along those lines: prospects of stormy weather pushed us to postpone our oral history screening event. It was initially scheduled for Saturday, May 26th. The new date is Saturday, June 16th. The menu (fried shrimp, Hyppo pops), time (7pm), and place (Genung's Fish Camp) remain the same. It is a free, family-friendly event. See you there! This month we're also pleased to announce that we've joined the National Oceanic and Atmospheric Administration's (NOAA) "Voices of the Fisheries" oral history database. This comprehensive resource is a powerful tool for charting and understanding how marine and coastal livelihoods are changing—that's a goal we can get behind. We watched with trepidation as subtropical storm Alberto was forecast to reach St. Augustine Memorial Day weekend—as Voices participant Hugh Mercer says, "dealing directly with nature is a chancy proposition." That's why we decided to postpone our oral history screening event at Genung's Fish Camp to Saturday, June 16th. We hope you can join us at 7pm for fried shrimp and Hyppo pops, followed by a sunset screening at 8pm! June 1st officially catapults us into hurricane season in Florida—and we don't have to tell you that the last two years have been doozies for our northeast Florida corner. By their nature, hurricanes bring sudden, often devastating and permanent change. That's why we're interested in the storm stories of our region, and why we're sharing the experiences of people like Adam Morley, local boat captain and fish camp manager, who got a firsthand glimpse into 2016's Hurricane Matthew. We are pleased to announce that Matanzas Voices' collection has been included in the National Oceanic and Atmospheric Administration's (NOAA) "Voices of the Fisheries" oral history database! The cross-posting will help scholars and researchers more easily locate our work on the changing ways of life in coastal northeast Florida. You can search collections here. What does history have to do with protecting the environment? It's a good question, and one I've been thinking a lot about since Matanzas Voices joined Friends of Matanzas, a citizen-supported advocate for the Matanzas River. We believe that oral history and documentary work are inherently activistic: the more people are educated about the delicate, finite systems and resources around them, the more they understand, value, and protect them. That line of thinking highlights the importance of "memory keepers," people who are bearers of tradition and local history. Enter: Phil Cubbedge, one of the few remaining commercial oystermen in northeast Florida. No one knows the river quite like Phil, who is in this month's Voices Spotlight. Be sure to mark your calendars for Saturday, May 26th! We're hosting an evening screening event at Genung's Fish Camp to showcase some of our newest work. We hope to see you there! Thanks to everyone who shared their St. Patrick's Day evening with us at Genung's Fish Camp for the annual Friends of Matanzas membership meeting! We were buoyed by the enthusiasm, good food, and beautiful scenery (check out that sunset!). Did you miss it? 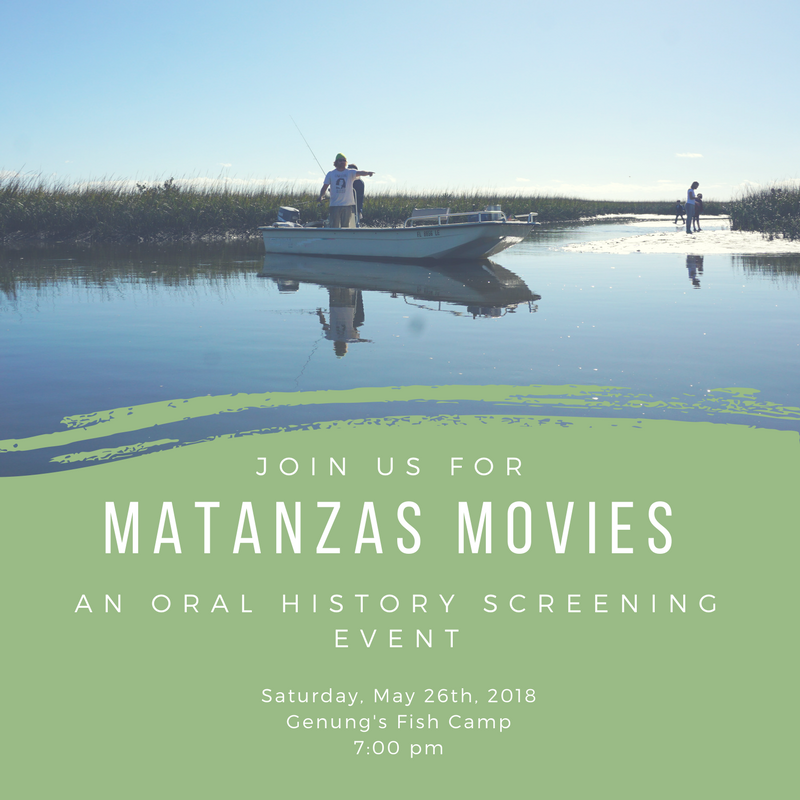 Are you interested in becoming involved with Matanzas Voices, the Matanzas Riverkeeper, and Friends of Matanzas? 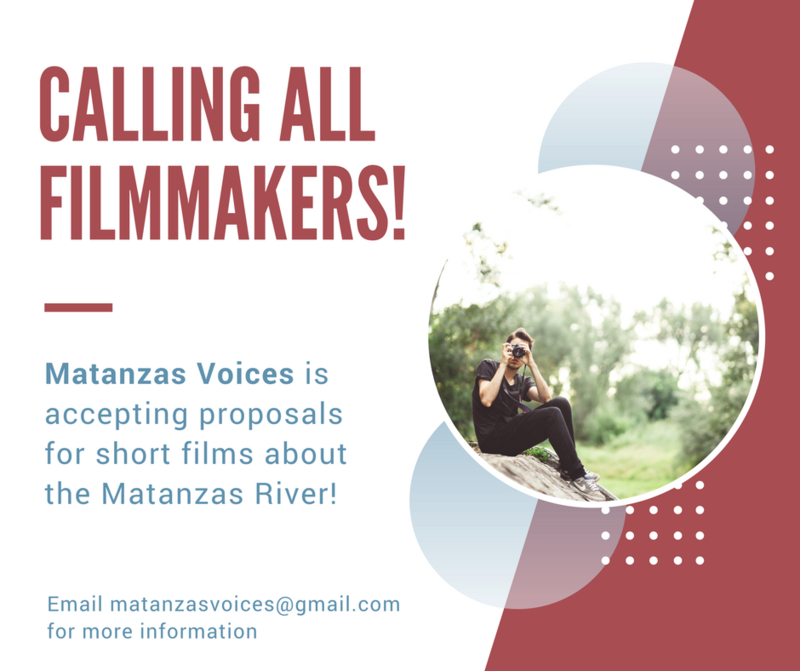 Shoot us an email at matanzasvoices@gmail.com for more information. "Oystering is like a dying breed. It is phasing out," says lifelong oysterman Phil Cubbedge. Phil, whose family has lived in the area for generations, descends from shell fishermen. He picked up the trade from his father, who once had an oyster house on Lena Street in St. Augustine. Commercial oyster harvesting in northeast Florida has dwindled over the years, due to increasingly polluted waters, river closures, and regulations. Plus, it's a hard job. "We go out there eight or ten hours. It's a long day." Read on to hear more from Phil, one of our last commercial oystermen. Our next screening event will be Saturday, May 26th, 2018! Please join us at Genung's Fish Camp in Crescent Beach for a sunset screening of some of our newest Voices additions. The event is free and open to the public. We'll provide the snacks, and beer and wine will be available for purchase in the bait shop. Please bring your own chair!